Out of the box on to the wall! 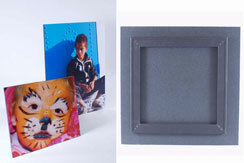 Features a regular print mounted on black gatorboard (foam core board) with a hanging kit on the back. When the print hangs on the wall it sits out about a half of inch from the wall making it appear as if it were “floating” on the wall. Available in Regular Finish or the Metallic. 11x14 up to 20x30 in size.